Want to have a pet that will not spoil the furniture at home, not to make a sound at all, even if you forgot to feed him, and practically will not smell? In this case, you will approach a giant African snail "Achatina Fulica". Don't worry, she will not grow the size of your apartment, its growth individual control very easily. Plastic container, coconut substrate, the vegetables. Find "Achatina Fulica" is not difficult, many people sell small little snails, and even give a gift. Purchase a plastic container for your pet. It needs to be with a lid that has air holes. The container does not leave never open, or the snail escapes. The bottom hostelite substrate of coconut coir or sawdust. This soil is sold in pet stores. Every day sprashivayte it spray water snails prefer a moist environment. Change the soil every three to four months. But clean the container at best once a month, without using chemical cleaners. It is not recommended to put in aquarium rocks or ceramic figurines, snail can damage on your house. Feed the snail the best night. Food just put it right on the ground. 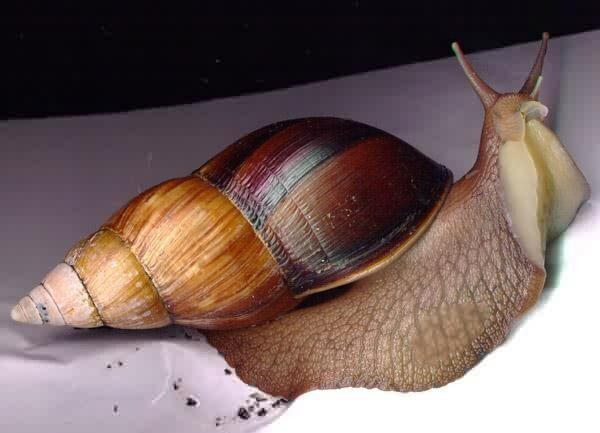 In the diet of snail can include cucumbers, tomatoes, cabbage, zucchini, lettuce, apples, strawberries, peaches, etc. Beware of giving a sweet pepper, not all of it is transferred, and any citrus. To include in the menu pet any fish food, and put in the tank dry shell of cuttlefish. Eating it strengthens the snail his house. In addition, use as fertilizer to strengthen the shell egg shells. Rinse the shells, dry, shalt finely and mix with the soil. If you do not feed your pet for a long time, the snail will just hide in the shell and closes the film. In order for her to "revive", place the shellfish under running warm water. Also bathe the snail once a week. Skip the water, make it room, put the pet on the hand or in a container. Follow the process of bathing to prevent escape. "Achatina policy" hermaphrodite, so it is likely that snails will be able to bring you the offspring. If you discover masonry, you can retrieve it to freeze and throw. Otherwise, be prepared to distribute about fifty small little snails. Some snails are very selective. They can only choose one product which they like most, basically it can be cucumbers. At first let the snail all possible, to determine her menu. To decorate the container can use a normal log or a branch from a tree that you need to pre-rinse. In summer you can feed the snails dandelion.